In these six pages, we see the glint of what Martin Amis calls, in a different context, “the worldflash of a coming future”. Attacks on civilian vessels were still an unpleasant novelty in the rules of engagement; the idea that the Germans would even hope to sink a ship of the Lusitania‘s size was absurd. And yet they had telegraphed their intention to do just that in a message printed the morning of departure in the New York World (with horrible irony, it appeared next to a Cunard ad). The attack on the Lusitania — and the cruel fluke that allowed it to sink in just eighteen minutes — changed everything. Using survivor testimonies, telegrams, archive film, intercepted wireless messages, submarine logs, and a wealth of secondary reading, Larson constructs a sort of Cinemascope account of the Lusitania‘s last crossing. Dozens of personal accounts and perspectives are woven into a narrative that also retains a keen sense of the grand sweep of history. Larson introduces us to the ship’s captain, William Thomas Turner, an old-school sea-dog and Cunard veteran (as well as their standing record-holder for transatlantic round-trips). We’re right there with the passengers as they board the ship on the morning of May 1; we’re in their cabins and at their dinner tables, privy to their gossip and trivial concerns. On the other side, Larson takes us right into the fetid belly of Unterseeboot 20, where we meet Kptl. Walter Schwieger, the handsome young naval officer whose combat stats reveal an increasingly ruthless nature. We’re also allowed to peek through the keyhole of Room 40, the secret heart of the UK’s cryptanalysis efforts, located in the Admiralty’s Old Building, where First Lord Winston Churchill was overseeing the increasingly embattled British navy. Finally, through the love letters of Woodrow Wilson and Edith Galt, we’re privy to the personal drama going on in the White House at the time, and the deep ambivalence the American president felt towards the war in Europe. In Larson’s account, just as the Lusitania steamed out of New York Harbor, British intelligence lost track of U-20. From then on, all we know from under the sea is what Schwieger logged and Room 40 was able to infer from the growing number of shipwrecks in the waters surrounding the British Isles. Meanwhile, above water, as the passengers onboard the luxurious cruise liner got to know one another, there was talk of submarines and torpedoes but its tenor was scornful. All types of people were sailing — “They brought their best clothes, and in some cases, their only clothes” — even if the historical record denies access to the thoughts of many of the sailors and those in the lower classes of travel. Still, what was left behind leaves more than enough sumptuous detail for a terrific book. It was a different age, and Larson has a great ear for it. A ship’s captain then had to be “three parts mariner, one part club director”, charming first class with his dinner-table patter. Wealthier passengers had been known to bring lion cubs aboard bigger liners; the animals were permitted to roam the decks and be petted by children. The passenger manifest for the Lusitania‘s final voyage included a Vanderbilt, a suffragette, a world-renowned theater impresario, a wealthy wine importer known as the “Champagne King”, and a Boston book collector carrying a stash of valuable Thackerayana and a copy of A Christmas Carol annotated by Dickens himself. The stoicism of some of these passengers when the ship later started to sink also feels redolent of a bygone era, like the string quartet that played itself out on the deck of the Titanic three years earlier. History is filled with what-ifs. 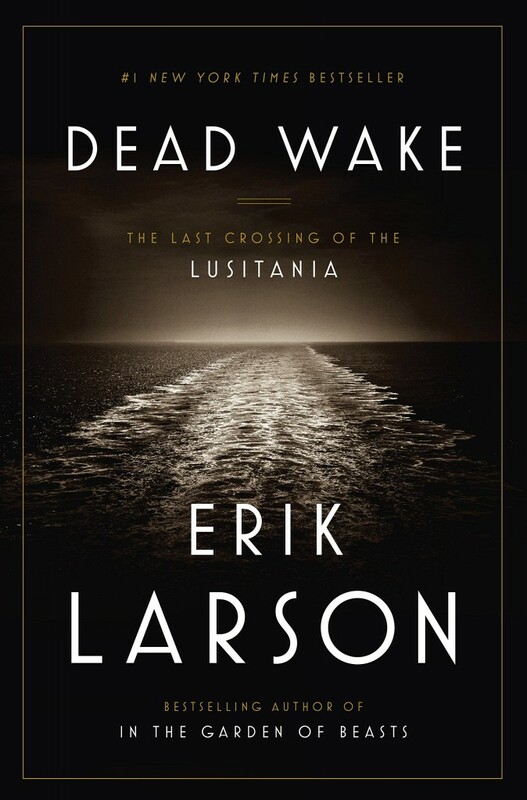 In Dead Wake, Erik Larson takes a pivotal moment in world history — one which would lead, indirectly, to the United States’ entry into the Great War — and teases out the agonies of circumstance, all the variables and contingencies that allowed what happened to happen, against all odds. Thanks to his meticulous research, the book also stands as a fine tribute to the victims of that fateful crossing. It’s now more than a century since the Lusitania sank, yet the words spoken by President Wilson to Congress in 1917, when the US finally joined the Allies in Europe, feel eerily contemporary: “The world,” he said, “must be made safe for democracy.” As a new evil reaches its tentacles across Europe, America is once again mired in ambivalence, caught between deeply opposed foreign-policy doctrines. What would it take to provoke decisive action? Erik Larson will appear at the 2016 Seriously Entertaining gala, I’ll Have Another, at City Winery NYC on February 1.